Vallibel Power Erathna PLC organized its first Art Competition Vidooka 2012 for the children of Erathna and Adavikanda villages and the children of its staff members, as a CSR initiative. It was held on the 20th of October 2012 at Erathna Maha Vidyalaya, was conducted under supervision of Mr. H. L. Jayasiri, Principal and Ms. Gayani Devika Amarasinghe, teacher of Erathna Maha Vidyalaya. Kids from the age of 4 to 15 took part in the competition, under four age categories of 4-5, 6-8, 9-11 and 12-15. There were almost 150 contestants competing for the prize with enthusiasm for almost 3 hours. Ms. Sibil Wettasinghe, Sri Lanka's best Author and Illustrator of children's stories was requested by VPEL to judge the competition. To recognize the talents of youth of Erathna and Adavikanda villages, VPEL will be selecting the best drawings for its Calendar for year 2013. UPDATE - VPEL had organized the Prize-Giving Ceremony of Vidooka 2012 Arts Competition on 04th December 2012 at Erathna Maha Vidyala. Twenty talented children were given prizes and certificates at the ceremony. Competition was held for four age categories and five winners were selected from each category. The Institute of Chartered Accountants of Sri Lanka, who is the national accounting body organised its 49th Annual Report Award Ceremony on 10th December 2013 at Waters Edge, Battaramulla. Vallibel Power Erathna PLC, organized inter site staff cricket tournament at Eheliyagoda Public Ground on 30th November 2013 representing six teams from employees of all mini hydro power projects established by the Company. This inaugural cricket match comprised Eleven Side League Cricket Tournament. Vidooka Art Competition was successfully held for the second consecutive year to recognize the young drawing talents of our rural. Ms. Dona Shyamalie Nishanthi Weerasooriya has been appointed as an Alternate Director to Mr. K D D Perera with effect from 11th November 2013. The Twelfth Annual General Meeting of Vallibel Power Erathna PLC was held at The Kingsbury, Colombo 01 on Thursday, 27 June 2013 at 9.30 a.m. The meeting was chaired by the Director Mr. Nimal Perera. The following resolutions were passed with the unanimous consent of the Shareholders. 1) Receive and consider the Annual Report of the Board of Directors, Financial Statements of the Company & Group for the year ended 31 March 2013 together with the Report of the Auditors thereon. as a Director of the Company. Directors to determine their remuneration. date of the next Annual General Meeting. The Company has announced Rs.0.25 (Twenty five cents) per share, Interim (Tax Free) Dividend for the year ending 31st March 2013. The dividend payment date is 19th February 2013 and XD date is 8th February 2013. Total value of the Dividend is Rs.186.7 Million. Mr. W. D. N. H. Perera was appointed as the Alternate Director to Mr. Prashan Buddhika Perera with effect from 22nd February 2013. Vallibel Power Erathna PLC was adjudged the First Time report winner in the Small Scale Category of ACCA Sri Lanka Sustainability Reporting Awards 2012. The Awards ceremony was held at the Cinnamon Grand Colombo on 20th February 2013. This was the 10th edition of the ACCA Sri Lanka Sustainability Reporting Awards. Vallibel Power Erathna PLC for the consecutive year was able to win an award from The Institute of Chartered Accountants of Sri Lanka. 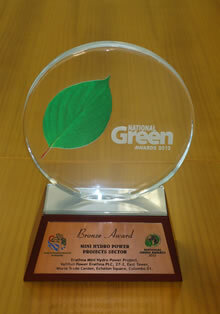 Erathna Mini Hydro Power Project has won the Bronze award in Mini Hydro Category at the National Green Awards 2012. The Small Hydro Power Developers Association elected a new executive committee for the year 2012/13 at the Annual General Meeting held on 31 October 2012 at the Royal Golf Club Colombo. Sri Lanka Minister of Power and Energy Patali Champika Ranawaka says that measures are in place to construct 200 mini-hydropower projects in the island. Water inflows to Sri Lanka's hydro power plants up to September 2012 was the lowest in 20-years and much lower than a year earlier which was also a drought year, the island's power ministry said. The Small Hydro Power Association (SHPA) yesterday cried foul over the sudden withdrawal of new tariff announced by the Public Utilities Commission (PUCSL) and warned the move by regulator had put 50 MW of renewable energy at stake. Sri Lanka renewable energy firms demand higher tariffs after depreciation. The delegation of senior officials of the Government of the Seychelles which accompanied His Excellency James Alix Michel,President of Republic of Seychelles on his State Visit to Sri Lanka, paid a visit to a mini hydropower project of Vallibel located at Erathna, Kuruwita. The Company released the first quarter results for the period ended 30th June 2012 on 14th August 2012. VPEL, recognizing the importance of continual growth, is in the process of obtaining the ISO certification. It has taken the initiative to establish an Integrated Management System of ISO 9001:2008 & ISO 14001:2004. An agreement was signed with Somaratna Consultants on 25th July 2012 for this purpose. This year, Annual Excursion of Vallibel Power Head Office Staff was to Trincomalee - Hotel Chaaya Blu. The excursion was on 21st and 22nd July 2012. As an initiative towards continual improvement, Vallibel Power organized a training program on Work & Life Balance and 5S to all staff on 30th June 2012. 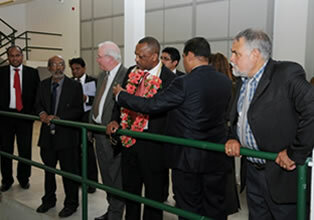 The program was conducted by Sri Lanka Institute of Development Administration (SLIDA) at SLIDA premises. The Annual General Meeting of Vallibel Power Erathna PLC for year 2012 was held on 26th June 2012 at Hotel Taj Samudra Colombo. The meeting was chaired by the Director Mr. Nimal Perera. The meeting was concluded with an informative company profile vedio presented to all shareholders. Vallibel is a diversified conglomerate which has invested in financing, banking, Leisure, Garments, Manufacturing industry and power sector. Under vallibel power it develops renewable energy projects to generate electricity and supplies electricity to national grid. Vallibel ventured into power generation business in early 2000 and successfully commissioned its 10MW plant in 2004, which later on went public with the record braking oversubscribing shares in year 2006, and has generated substantive profit for its shareholders. Since then vallibel has invested extensively in hydro power sector contributing more & more green energy to the nation.